Yes spring is here and everything is greening up, birds are chirping, no sign of snow or rain but that could change any time soon. Today was spent outside with hubs who loves working outdoors and has been clearing out old vines and shrubs and overgrowth of wild stuff in our yard. Part of a yard that isn't far from the old rail fence but yard I didn't venture into for many reasons, snakes for one and just unfamiliarity and plain overgrowth. 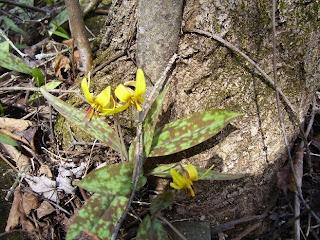 Well today JB uncovered ground and found some wild flowers I didn't know existed. I don't even know the name of them but I have seen many times these long shaped leaves with purlple sort of dots or colour markings on them. I took a pic to show you all so you can help me to identify them. They are really pretty and probably won't last long but I didn't find many in flower so I stopped to admire their beauty. I love spring, one of my favourite times of the year, you see things come back to life before your eyes and the sites, sounds and familiar smells of spring after long cold and sometimes harsh winters. 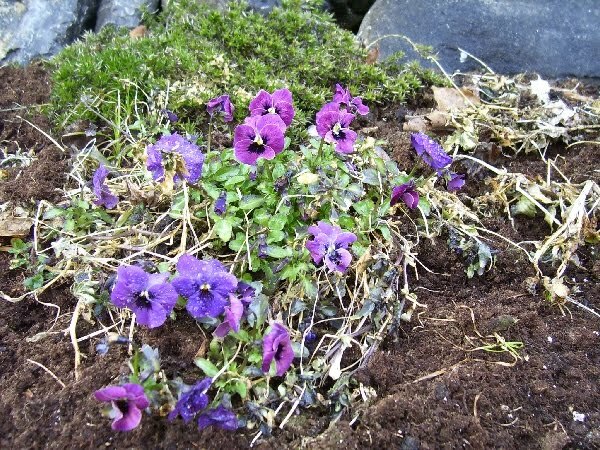 I have also taken a picture of some of my pansies that have begun to bloom in the garden, this variety said they were like a longer lasting daisy and of course are very hearty. 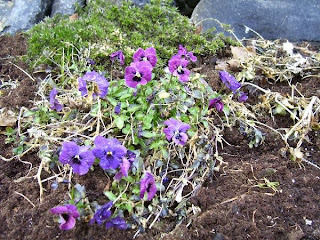 I thought I saw something purple from the kitchen window the other day and I went to investigate and here we have a beautiful cluster of them and more to come in other areas of my rock garden. Ah yes spring is here. 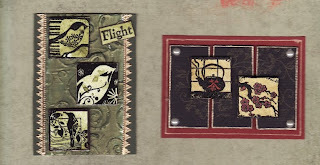 And...I have been working on my swaps and trades and wanted to show you my lastest ATC's with inchies. Becky one of the Mods over at ATCforBeginners chose do inchies on an ATC so I worked away at a couple cards the other day and completed these for my trade partner Laura in the Carolina's. Hope she likes them. 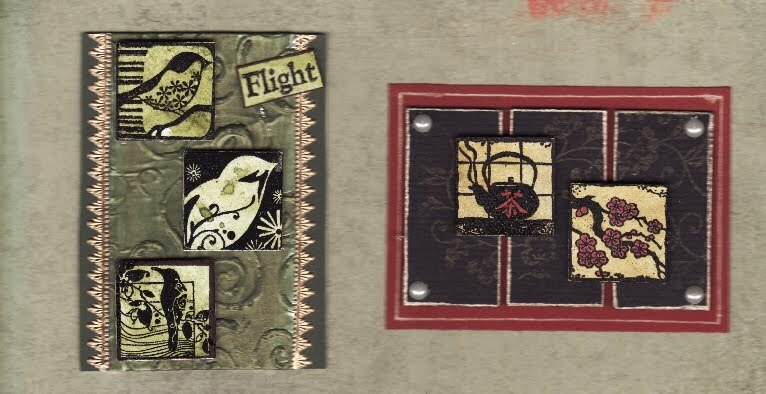 I love Asian themes so thought of this clever panel and then did some distressing background papers them stamped my asian inchie stamps and applied to the panels. Added some pearls at the corners some gold gel pen and that was it. The bird inchies I distressed some papers in green my fav colour. Green I find very comforting and earthy, I think I was green in a former life, perhaps a frog or small green critter. The background I used the foil tape, embossed it then painted it with acrylic metallic Peridot paint. I added some German scrap I finally got my hands on and added my bird inchies and I rather like it. So Lesley has been busy working outside and in and watching PlayOff hockey. Til next time, keep your head up, eyes open and enjoy each day to the fullest. Remember each day is truly a gift from God. Hi Lesley! It sounds so weird to hear you talking about spring while over here in Australia we are experiencing beautiful autumn sunshine. The mornings are crisp and fresh, I suppose just like your spring. You sound inspired at the moment. It shows in your work. I have some foil tape but don't know what to do with it. On closer examination I am still a little in the dark on it. Perhaps you could help?